FILE - Firefighters battle a petrochemical fire at the Intercontinental Terminals Company in Deer Park, Texas, March 18, 2019. Kristin Crump and her two kids put damp cloths over their mouths Thursday for the short walk from their suburban Houston front door to their car, defying an order to remain inside because of dangerous fumes coming from burned-out petrochemical tanks a couple of miles away. "It's pretty harrowing,'' said Jeff Fountain, a chemist who lives with his wife and three children about four miles (6.4 kilometers) from the plant. 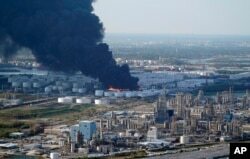 FILE - A plume of smoke rises from a petrochemical fire at the Intercontinental Terminals Company in Deer Park, Texas, March 18, 2019. Authorities haven't revealed the cause of the blaze. They said Wednesday that the benzene levels near the facility didn't pose a health concern, but they issued the shelter-in-place order early Thursday due to "reports of benzene or other volatile organic compounds'' in Deer Park, which is about 15 miles (24 kilometers) southeast of Houston. "The most important thing is that the levels that have been detected are still not high enough for the level of concern that people may be having,'' he said. The EPA conducted air quality tests throughout the Houston area, both on the ground and from a small airplane, and "measured no levels of hazardous concentrations,'' EPA official Adam Adams said Wednesday, hours before officials imposed the shelter-in-place order early Thursday. "This issue isn't over just because the fire is out. We want systems in place that will protect our communities,'' Parras said Wednesday.